Your niece has come a long way from playing with your make-up. Now a grown woman, she's a powerhouse all to herself. Leading meetings and winning clients, your niece is a capable woman. But underneath you'll always see the little girl you fell in love with. 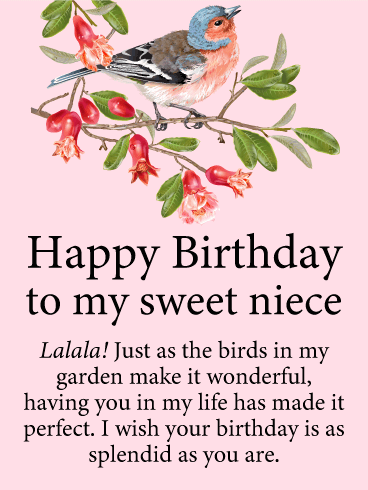 Bring back the fond memories and everlasting love by wishing your niece an amazing birthday with this beautiful card! 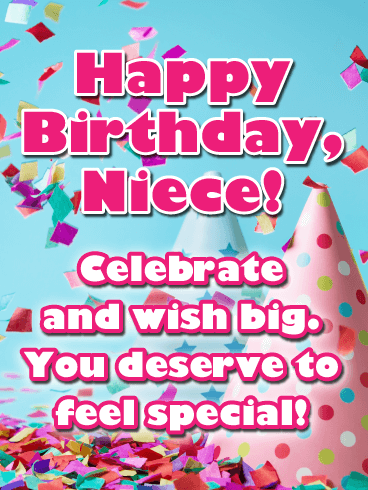 A pink party hat and lots of colorful confetti make this birthday card for your niece extra special! 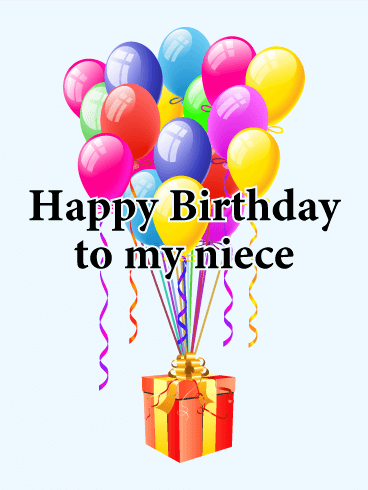 She’s an important part of your family, and you want to make sure she celebrates big and wishes even bigger. So send this festive greeting along and she’s sure to be smiling big all the way until next year! Songbirds fill the air with delight and their chirps make one feel contented. There's a natural ease to their beauty and song, just as your niece makes a day delightful. There is no one else in the world as special, as precious as she is. 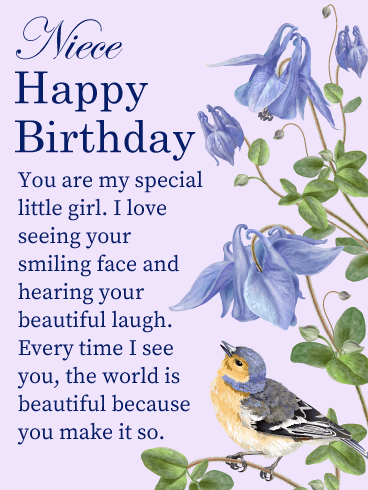 A unique girl whose calm nature soothes all around her, make sure your niece has an amazing birthday by sending her this stunning birthday card. Just like the blue blooms of spring make the day lovely and peaceful, so to does your niece improve an ordinary day. She's a beautiful girl, full of life, and the apple of your eye. 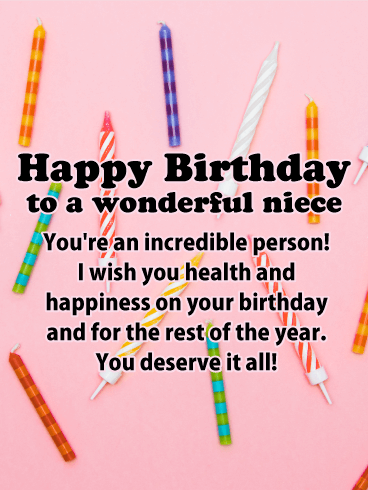 Give your niece the birthday she deserves by sending this gorgeous card. Let her know how much you love her and how stunning she is. It's guaranteed to make this birthday her best birthday. Watching something grow, from seed to stem to bud to blossoming flower, is an experience few people notice. But with your niece, you've savored every moment. Her birthday is simply the next one, a stage of growth where you can look back to see how far she's come and look forward to wonder at how far she'll go. Your niece is amazing. Tell her that on her birthday. 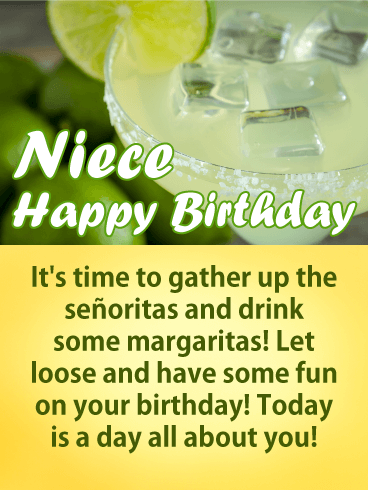 Encourage your niece to go out and have a blast for her birthday! Birthdays are meant to be awesome celebrations, surrounded by friends and family who love you. While you might be miles away, you know your niece has surrounded herself with only the best of people. Wish her the night of her life and a day full of fun with this great birthday card! One wish, two wish, three wish, four. Your niece deserves ten times more! After all, your niece is adorable. She has the cutest smile, the most charming laugh, and a sympathetic soul. Let her know she's the perfect package and that you'll make her birthday wishes will come true. 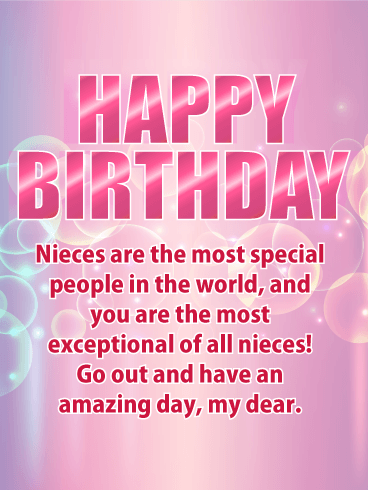 Your niece deserves the best birthday and this birthday card ensures she gets it. Your niece may not be your own child, but you love her just as fiercely. You find yourself catering to her wishes, doing things to make her smile, praising her at every opportunity. Family is a knot of people who love and support each other, and you will gladly lift up your niece as high as she wants to be. 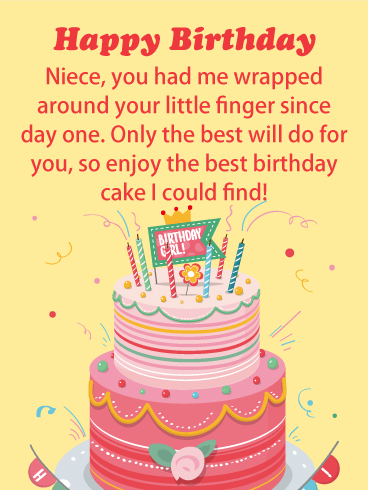 Let her know that you will be there every step of the way by sending your niece a festive birthday card. Sassy yet sophisticated! What do you love most about your niece? 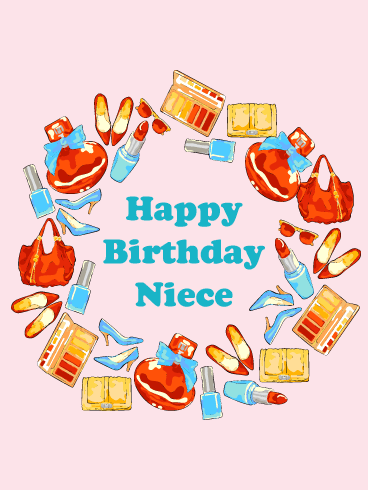 Send this stylish birthday card to your niece who knows how to rock her own look and lives her life with confidence and flair. An attractive stiletto is all about fun and a reminder to have fun partying with her friends tonight. 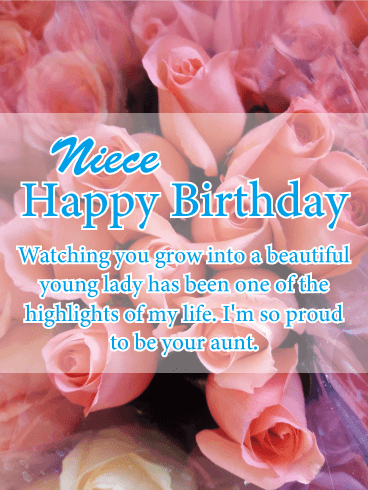 A classy birthday card is a fun way to say happy birthday to your fantastic niece! One wish, two wish, three wish, four. Your niece deserves ten times more! After all, your niece is adorable. She has the cutest smile, the most charming laugh, and a sympathetic soul. Let her know she's the perfect package and that you'll make her birthday wishes will come true. 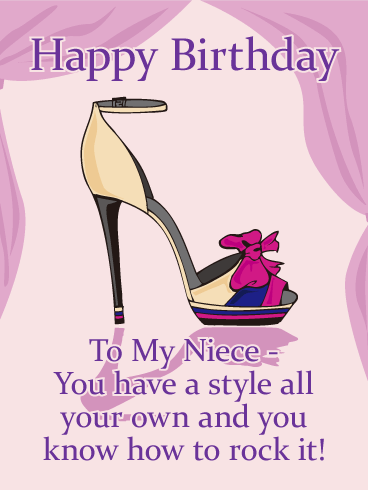 Your niece deserves the best birthday and this card ensures she gets it. Birthdays are for indulging in your favorite things and being extra good to yourself. 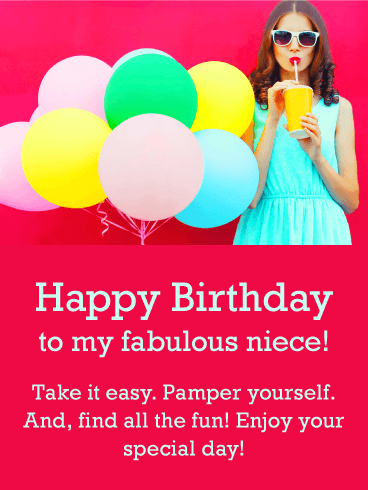 Remind your niece to pamper herself good this year when you send her this fun birthday greeting card. Your niece should take it easy and treat herself to something amazing, like a pedicure and some time spent by the pool! 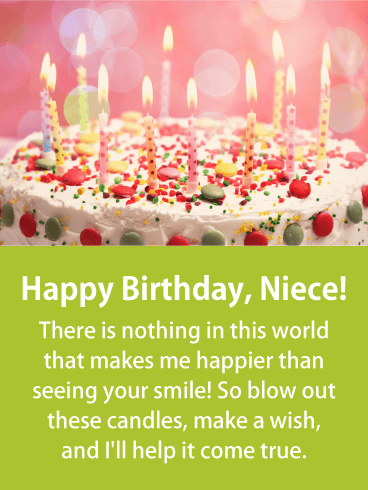 This special birthday card for a niece is exactly what any woman wants to hear!